Apple Red Devil is a red fleshed apple from Kent in 1975. The bright red colour of the skin seems to bleed into the creamy white flesh leaving a pinkish red stain. The juice from Apple Red Devil is pink and most attractive. An excellent eating apple, Apple Red Devil has a sweet strawberry-like flavour. 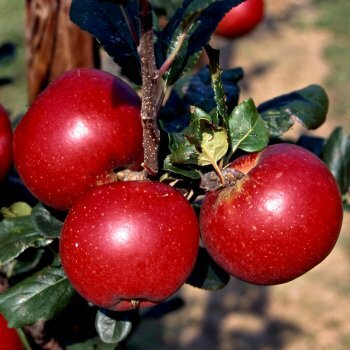 This apple is self fertile which means you only need one with no pollination partner so it's ideal for smaller gardens. Red Devil doesn't require a pollinator, so only one tree is required. If you do wish to plant multiple fruit trees, you will need to take the rootstock into consideration. An apple tree on a MM106 (semi-vigorous) rootstock will require approx. 4.5 metres between trees, whereas one on a M27 (very dwarf) rootstock will require approx. 1.5 metres between trees. Using 50% of the original soil and 50% compost, fill in the hole and firm around gently. Make sure not to bank the soil up around the collar of the tree. We recommend planting fruit trees using a stake and tie and a rabbit guard. The Apple Tree Planting, Pruning & Care guide has more detailed information on planting apple trees, as well as videos on planting trees and using stakes and ties. If you’re planting in spring or summer, water well and regularly for the first few months. If you’re planting in autumn, you may only need to water your tree a little. It is important to keep an eye on young fruit trees and increase watering if there are extended periods of hot or dry weather. Keep the area free of competing weeds and grass for the first couple of growing seasons.